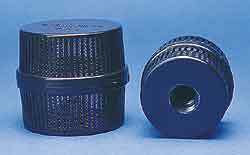 Pump strainers should be installed on the inlet of all submersible pumps. They will protect your pump from drawing any debris in that may harm or clog the pump operation. They are not required if pump is in operation with Biological Filter. Strainers screw onto inlet of pump. Specify proper code for thread size. Two-piece plastic construction screws apart to clean. 3" diameter. All Cal pumps have stainless steel shafts which assure trouble-free service and double seals at motor shaft. Pump housing and impellers are nylon for corrosion-free service. Runs very quietly. Models No. A210T through No. A430T are constructed of high silicate content aluminum, cast in precision dies for uniform quality. Models No. S320T through No. S1200T are constructed of brass and stainless steel. 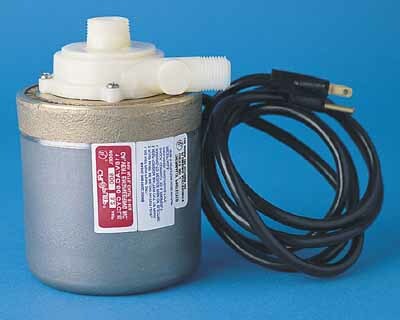 All Cal pumps come with a control valve. Models No. A210T through No. S1200T are furnished with a six foot, twelve or twenty foot heavy-duty three-wire ground type service cord; neoprene, oil and waterproof. Underwriters Laboratory approved. Each A-model has a twelve-month manufacturer’s warranty and each S-model a 24 month manufacturer’s warranty. These pumps operate equally well in any position. Inlet must be under water. @ 1ft, @ 3ft etc. refer to number of gallons of water returned to the pond depending on the height of the waterfall/fountain. *Model will not connect to filter. The newest, highest quality UL listed pump on the market. Its durable high temperature Noryl Thermoplastic can withstand extreme heat and corrosion. 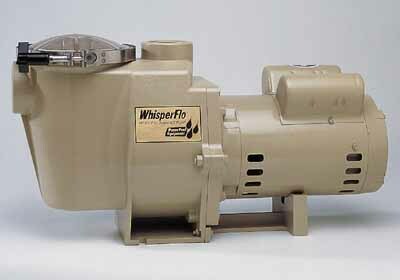 Whisper-flo is designed for long life and is backed up by a 2-year manufacturer's warrnty. It moves more water in less time using less energy and creating less noise than anny other pump operating within the normal range of 35-80 feet of head. Whisper-flo is available with standard 2" inlet and outlet making plumbing connections a cinch. 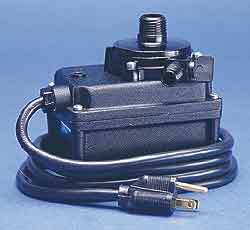 Whisperflo operates at 220 volts and is compatible with our Sand Filter.